Come along and help us celebrate our 40th Anniversary on Saturday 21st & Sunday 22nd July! Our own steam & diesel locomotives will be operating along with full sized traction engines and steam lorries. Ticket price includes unlimited travel on all service throughout the day (subject to availability). 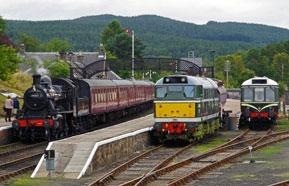 Our Panoramic Diesel Railcar will be operating at 17:20 taking you up to Dulnain Bridge to see the progress of our extension towards Grantown on Spey.